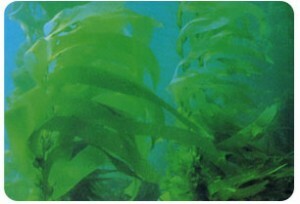 Alginate is a kind of natural polysaccharide consisted in brown seaweed, as a natural product generated from alginic acid indwell in seaweed and minerals indwell in sea. Alginic acid is a mix-polysaccharide composed of D-mannuronic acid(M) L-guluronic acid(G). Alginate absorbs water quickly, which makes it useful as an additive in dehydrated products such as slimming aids, and in the manufacture of paper and textiles. It is also used for waterproofing and fireproofing fabrics, in the food industry as a thickening agent for drinks, ice cream and cosmetics, and as a gelling agent for jellies. Alginate is used as an ingredient in various pharmaceutical preparations, such as Gaviscon, in which it combines with bicarbonate to inhibit reflux. Sodium alginate is used as an impression-making material in dentistry, prosthetics, lifecasting and for creating positives for small-scale casting. Sodium alginate is used in reactive dye printing and as a thickener for reactive dyes in textile screen-printing. Alginates do not react with these dyes and wash out easily, unlike starch-based thickeners.